RAIL bosses are being urged to improve access to Waverley Station by reopening one of the entrance ramps to pedestrians and cyclists, providing more help for the disabled and introducing taxi marshalls. The proposals are among a list of measures discussed at a summit called by city transport convener Lesley Hinds of individuals, groups and politicians concerned about problems at the station. And now Councillor Hinds is inviting Network Rail chief executive Mark Carne to come to Edinburgh for talks on the long-running controversy over access at Waverley. The row dates back to the decision to stop cars from entering the station and ban taxis and cyclists. Last May, a Church of Scotland minister died after he was hit by a reversing car which had reportedly tried to drive into the station only to find its way blocked by security barriers. Cllr Hinds said: “We have met Network Rail several times and some things have improved – for instance, the signage is better than it was – but overall it’s really just not good enough and we felt we need to take it to another level to get it sorted out.” She said there was still a lot of anger about the situation and there were some obvious improvements which could be made. “Cyclists have to get off their bikes and walk down, sharing a very narrow pavement with pedestrians,” she said. “Why can’t they open up one of the ramps for people and/or cyclists? “People with disabilities are still complaining about access. I asked months ago about a call button at the Calton Road entrance so people could summon assistance. Also discussed at the summit were calls for a re-examination of the number of taxis catered for, the location of taxi ranks, how signage could be improved at Calton Road and whether there was any scope for taxi marshalls to be used at the station. Other proposals included a covered seated area at Calton Road for drop-off customers and the possibility of this entrance being staffed because many disabled people and others felt vulnerable. And it was suggested paper and digital maps could be produced with full information on all aspects of access to Waverley. 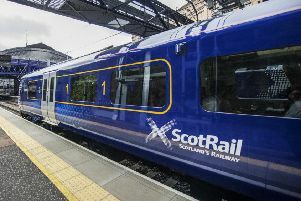 A Network Rail spokesman said: “Waverley is more accessible now than at any time in the past with lifts and step-free access to and from Princes Street, Market Street and Calton Road. Free short-term parking is also available in the New Street car park to the south of the station for those dropping off or picking up passengers.